The day started with a bit of concern as it was snowing heavily and, indeed, Luton Airport, only 12 miles away, was closed all morning ! The weather improved later and the team (comprising 13 dentists and 7 nurses) met up at Terminal 5 this afternoon. Unfortunately they are one dentist short this time as one of the team has developed shingles in the past week. As always, they are accompanied by boxes of equipment that they take with them as part of their luggage allowance. This time Liz is joined by a dentist, Beryl Hinton, with whom she studied at Bristol and with whom she has maintained contact ever since. Liz went onto the BA site in advance and is looking forward to watching An Education en route but they will all focus on getting sleep as they will be travelling for the best part of 24 hours door-to-door. Flight BA 047 to Dar es Salaam was due to take off at 17.40 (GMT) but did not actually leave until 19.00. Whilst this meant hanging around at Heathrow, it is actually a blessing in disguise as it means that they have to spend less time in the steamy heat of Dar Airport (see previous blogs). The flight is due to arrive in dar at 07.10 local time (04.10 GMT) and they then have 3 hours to wait until the Precision Air (!) flight to Mwanza on Lake Victoria. Welcome to new readers of this blog. I am aware that the relatives of one of the nurses, Prue, will be tapping in regularly from New Zealand ! Flight BA 047 landed at Dar es Salaam's Julius Nyerere International Airport at 06.53 local time (03.53 GMT). By the time I woke up they were due to be boarding and Liz had her phone turned off. They are now going to fly up to Mwanza on Lake Victoria with Precision Airways, which describes itself as 'Tanzania's fastest-growing airline', prompting one to ask 'Just how many airlines are there in Tanzania, anyway?'. Flight PW0412 is due to depart at 10.10 local time (07.10 GMT). Su was not particularly looking forward to her on-board meal, having opened up her sandwich-box last year to find the contents covered in an interesting looking green mould! I was just leaving work tonight when I saw that I had an incoming call from TANZANIA MOBILE. When our son, Luke was in Tanzania last year he bought a SIM card and we put that into a spare phone for Liz to take with her. Quick conversation to reassure me that they had arrived safely. When I got home there was an email from Liz as well. She DID manage to watch An Education and can recommend it. She spent the flight from Dar to Mwanza chatting to an independent safari guide in the next seat. Ever the bird-watcher, Liz reported loads of kites circling the mosque in Mwanza and, as last year, complained about the noise of the call to prayer, blasted out over the loudpseakers. They were about to go out to the Tilapia restaurant for dinner (see http://www.hoteltilapia.com/ ) on the shores of Lake Victoria. Tomorrow is the orientation day, when the charity goes through what they can expect and general operating (excuse the pun!) procedures. In the afternoon, they are due to fly up to Bulyanhulu Gold Mine, which will be their base for the next two weeks. If you want to find out about the mine, click here or here. I have had lots of emails today, advising me that people are accessing the blog, including our niece in Utah. Thanks to everyone for feedback on this blog. One humorous comment yesterday was that it is a sad state of affairs that Liz, and the other dentists, have to mine their own gold for fillings! The reality, of course, is that, once they get out to the local 'clinics', where they treat patients and do the training, there is no electricity and no running water and so fillings are out of the question. It is mainly extractions and general clean-up. One patient last year had been in pain with an abscess for FIVE years. Woe betide any patient at the team's UK practices who complains about not being able to get an appointment for a couple of weeks! Well, bloggees, I was (quite literally) about to post an update about lack of any communication when Liz phoned on someone else's phone. She later also managed to get through on one of her two mobiles. There is only internet access if you have your own laptop with you and she did not take hers because of the weight limitation. They flew up to the gold mine on a 12-seater plane run by Coastal Aviation (see http://www.coastal.cc/ ), flying over paddy fields en route. Security is intense with airport-style checks in and out of the mine (in case of a few 'samples' getting out!). 7 years ago the airport at the mine was ram-raided and the plane that had just landed, which was carrying the wages for the mine-workers, was attacked by an armed gang who shot one of the guards. Ian Wilson, the founder of Bridge2Aid, had only just departed in another plane. Apparently the gold itself is helicoptered out. The location of the mine (which is the 3rd largest in the world!) is shown on the map below. The reason they use the mine as a base is that mine workers used to have to go to Dar for treatment and were taking a little too long to do the round trip. 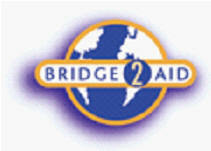 As part of the funding for the charity side, Bridge2Aid run The Hope Clinic in Mwanza and the mine workers now go there. There are some 2800 people on the site, with a school for 11 pupils and even a golf club ! The team are going to a BBQ tomorrow and later to a social night at the golf club. They are staying in diverse accommodation around the site. Liz is with two others in a house with a verandah and they have a room each; the others are in varioius single rooms. Prue met up with another Kiwi who is the Health and Safety Officer for the site (what a job!). Before anyone asks, he's married with 3 kids. Liz says that the place is very much corporate-ville, with Company Values posted on the notice-board - just the sort of thing that really turns her off. One evening they hope to go down the mine (it is not open-cast, as I had thought, but a 'proper' mine). The trip takes 2 hours and should be interesting. This is the seventeenth time that a group of dentists have gone out with the Dental Volunteer Programme. In my humble opinion Ian Wilson is one of those people who ought to be quietly nominated for an award in the New Year's Honours List. Tomorrow the dentistry starts. It will take them about an hour to get out there along unmade roads (it has been raining!) and they will meet the Clinic Officers, whom they will be training, when they get there. Those of you who read last year's blog will recall that one of the trainees, Julius, was, himself, quite handicapped, having a withered leg from polio. He is now fully qualified as a doctor and does all of the treatment at Bukumbi, the leprosy village that is supported by Bridge2Aid. Julieth, the trainee from last year who was pregnant, gave birth only a week after the team had departed back to the UK; the dedication is mind-blowing. No snakes or other undesirables yet. There are monkeys around the site and Liz is looking forward to the weekend off in the Serengeti. Su and Tracey have decided not to go on the safari this year but have taken the option of staying in a hotel on the shore of Lake Victoria. UNFORTUNATELY, they were not too chuffed to learn that someone got killed by a crocodile just near the hotel only last week ! Still.... it won't be hungry now, will it ? Overnight I had an email from Judy, one of the dentists who has been to Tanzania a number of times but could not, unfortunately, accompany the team this time.She pointed out that there is actually a clinic on the mine site and that Ian Wilson does come up there, from time to time, to do basic dentistry. Barrack, the Canadian owners of the mine, offered to host the dental teams as part of their Corporate Community Charitable projects. They provide the accommodation and the food for free. They also provide a coach and driver, security guard and medical helper each day. I phoned Liz as soon as I got home and got through first time, which made things much easier. And so, today, the real stuff started! The bus was late and the General Manager of the mine turned up and Liz said that she would not want to be the person who messed up.They made their way out to a village and 'set up store' in a three-walled building with an open verandah on the fourth side. This meant that they had an audience most of the time which was entertaining for both sides; could be an interesting idea for dentistry in Knebworth? There is an HIV clinic in one of the other buildings and a mother-and-baby clinic in another. Liz set up her iPod on the stand with external speakers and so they had plenty to listen to (including my YES and Genesis albums which were also uploaded to the iPod when we synchromised it with my PC!). Doubtless Liz selected her new Take That album or Keane instead. At one stage here was a chicken running around the clinic which they had to shoo away. One of the Clinical Officers failed to turn up, which is disappointing and questions will be asked. One of the others, John, is on home turf as this is where he will practise when he is qualified. As always there is no running water but, bizarrely, there is an old dental chair which must be powered by a local generator; it was not working today. The Tanzanian District Commissioner turned up at the clinic and thanked them all profusely for coming over from Blighty. All of the new members of the team are enjoying the wildlife. There were 5 marabou storks (revolting birds!) walking around the dining area today and scavenging. There is also a family of monkeys with babies which are cute. They went to the BBQ today and the steaks were enormous; one can only imagine the appetite of a mine worker! Beryl and Ceri had been swimming in the pool; that must have woken up some of the miners at the nearby bar! All for now - Olympics to watch. Told Liz the disappointing news of our curling demise. The news about Cheryl Cole (now Tweedy, once again) had already reached them by a text. I managed to speak to Liz just after she and Kiaran had returned from their G+Ts at the Golf Club Social ! The others had gone to bed sometime earlier; Beryl had even been out jogging, which really impressed the rest of the team. Last night a tropical storm raged for most of the night and Liz said it was like one that we had experienced once in Thailand. Just when you think that it could possibly not rain harder ... it does just that. This morning the compound was all 'lakes' and one of the staff, who had been there for two years, said he had never seen it rain so much. Shame that Liz didn't take a raincoat but the last two years it has been fine every day. They made it along the washed-out roads but they only saw 50 patients today. The absentee from yesterday made it today and was assigned to Liz. He seems to be very good and managed to play catch-up. One of the other trainees, however, is really struggling and will be hard pushed to qualify at the end of next week. It's very sensible that the charity takes this very seriouisly and does not just pass everybody. One of the dentists, who knows another team member from last year, had not even appreciated that she would be doing so much training. Today the chicken was joined by a cockerel and a chick which ran around under the chairs. Liz thought she saw a fox on the golf course and then did a double-take when she remembered that they don't have foxes and realised it was a jackal. They have booked their trip down the mine for next Wednesday. It is 1.5km (1 mile) down and then spreads out along tunnels for 5 km in each direction. Tomorrow they have to pack up all of their stuff as they will be based in another village next week. At 15.00 they fly back to Mwanza and then go to the various options for the weekend. Liz left her binoculars there and will need them as she, and several others, will be heading the Kijereshi Lodge (see http://www.kijereshiserengeti.com/ ) in the Serengeti. En route they will pass the Stopover Lodge, where they were based in 2008. Communications (as one would hope!) in the middle of the National Park are poor and I don't know if I will be able to get through but have promised to call her at about 18.00 GMT tomorrow. Apologies for any typos; FrontPage, which I use for web design, does not seem to know about Spellchecker! Well, as the team zzzz'ed away in Tanzania, I stayed up to watch the gripping final of the ladies curling. It dosn't seem like 8 years ago that we watched the British team win gold! I managed to get through to Liz at about 18.00 GMT and they had only just arrived at the Kijerehi Lodge. This is the first time that I have ever managed to get through whilst they have been in the Serengeti. They went out to the village again this morning and Liz was assigned to Kennedy, the guy who turned up only on the second day. He is still very good and Liz has no doubt that he will get through. The dentists started today to look through the written exam that the trainees will be asked to sit on the last day. Prue found a slug in her luggage and Tracey found 'large animal droppings' on her bedspread - well, this is Africa ! They also saw a dik-dik (see below) outside their room. They flew back to Mwanza and picked up their weekend luggage bags. They also met with the other Bridge2Aid team who are billeted at another gold mine and were also reunited with the sterilising equiipment for their team which had, apparently, gone to the wrong mine, forcing them to borrow equipment from the other clinics. Tracey and Su went off to Ryan's Bay Hotel (ss http://www.ryansbay.com/ ) for the weekend, doubtless on the look-out for crocs ! They drove along the road towards the Kenyan border and then, as darkness fell, turned off down the dirt track towards the Sererngeti. The roads are in poor condition, because of the rains, and Liz said her back (she has been having physio) is killing her. Tomorrow she is doing the half-day trip but Beryl, who has not been to Africa before, is doing the full day. Liz will probably stay around the hotel and watch the birds. She has not taken my camera with her this year but a few of her photos from last year are below. Click on any to enlarge. I was able to tell them the news about the Chilean earthquake of which, needless to say, they had heard no news. I waited until the glorious Manchester United had successfully retained the Carling Cup and then managed to contact Liz in the middle of a lightning storm that made the one the other night look like a shower! 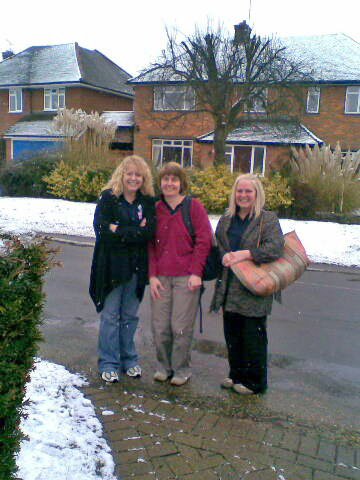 The other team, who had gone out for the whole day, had only just returned, whilst Liz had been back for the afternoon. Strange to think that, in the middle of nowhere, on the edge of the Serengeti, she had also been watching the end of the Carling Cup. She has made a list of the vast number of bird species that she saw, including four ground hornbills (see below), which are strange ungainly birds. Readers of the No.1 Ladies Detective Agency will know that, in some countries, these are considered to be omens of bad luck. The other team were buzzing with everything that they had seen, which included leopard, cheetah, elephant, etc. Many of them had never been to anywhere like that before and so it is good that they have seen a lot. After a minute or so the signal was cut and I could not get through again, probably because of the storm. Tomorrow they go out into the Serengeti again, before returning to the gold mine via Mwanza, subject to the flooding not being too severe. The wonders of modern communication!. I was dozing away on the train home tomight and was woken up by my phone telling me that TANZANIA MOBILE had left a voicemail whilst I had been in the Potters Bar tunnels. In the message Liz said she was shattered and about to go to bed. I managed to phone her back - still on the train (I not her) - and got an update. They did not do much today - just hung around the lodge and had a swim - mainly because many of the roads were washed out. They made their way back to Mwanza and split up again to go off to the two mines (the other is open-cast and so the team will not be going down it). During the first week the other team had treated one patient who had broken his jaw NINE months ago and it had not healed properly. Understandably, he was in great pain but they managed to sort out a lot of the infection. Somewhat bizarrely, I passed on greetings from Su's brother, whom I met in the sauna yesterday afternoon. Tomorrow they are setting off very early as the second village is further away and the roads are in a bad state. Sounds like they will be pretty shattered when they get back to the UK. Got through first time this evening. Unfortunately they had a problem with the bus this morning which had a puncture and, as a result, they did not arrive at the village until 11.00 which rather truncated the day. They have been treating lots of mothers with young babies and one man who had had a swelling on the roof of his mouth for SEVEN years. Beryl treated a man who had lots of roots showing and broken teeth. She and the trainee decided to take all of them out, at the end of which the patient went down on his knees and offered them a prayer. This village is a bit further away and seems a lot poorer with children running around with no shoes and looking a lot more scruffy. The 'clinic' is two rooms in a building where the team set out their equipment. The absentee from day 1 was absent again as his daughter had to go to hospital and Liz fears that he may not pass at the end of the week. Tomorrow and Thursday she has the guy who is having real difficulties learning all of the techniques. She describes the countryside as more picturesque than before; they travel through flooded paddy fields to get to the village and there are loads of herons and storks. Got through quite late today. At first I thought this was because they had been a mile underground but they had did not, in fact, manage to make the visit of the mine as there was a lot going on and the staff were too busy to organise the visit. The wayward trainee did NOT turn up, which is a real shame. Liz is sure that Ian Wilson of Bridge2Aid will be asking some very serious questions as the organisation and effort to get the team out there and ready to go is extensive. En route to the village every day they go past an HIV clinic, just outside the mine compound, which is funded by the mine. It is in 4 container lorries, in one of which educational videos are shown. In another there is testing equipment; as reported in previous blogs, the percentage of the rural populace that is HIV-positive is frighteningly high. Yesterday they witnessed a group of women who walked by in coordinated gold dresses. They made their way to a neighbouring building and proceeded to practice their gospel singing. A lot of the dental problems that they see are exacerbated by the fact that they have a habit of chewing on sugar cane, which is gown locally. This is NOT recommended if you want to avoid dental problems ! Prue is, apparently, regularly to be seen surrounded by loads of children and there should be a lot of colourful photos. I spotted the following article today on the BBC website. This is only on the far shores of Lake Victoria and is evidence of just how much it has been raining in that region. Tomorrow, after they finish at the clinic, they will pack up and fly back to Mwanza, where they will go through an intensive de-brief. Liz has made loads of notes this time as to how they can improve things, particularly with regard to the equipment. Liz phoned me on my mobile whilst I was still at the office. She was in floods of tears because she has lost her wedding ring. I reassured her that this really did not matter and that it did not mean that she was no longer married. She always takes off rings when 'operating' and it must have dropped out of a pocket. Unfortunately this development came at the end of a fraught 24 hours and so she was, understandably, very emotional. I have not worn my ring for about 3 years due to osteoarthritis and one solution may be to make one for her from mine. We also spoke later in the evening, after they had been to the New Mwanza Hotel for dinner. It was much easier to communicate as there was not that dreadful lag that makes you speak over the other person. She thinks the 'ring from a ring' suggestion is a great solution. This morning they treated about 70 patients and packed up at 12.30. Liz then sat and invigilated for 90 minutes, whilst the trainees sat their written examination. They each received a certificate, confirming that they had attended, but two of them will be told afterwards that they need to have additional training. They call one guy Mr M. because his name is too complicated and he will require extra tuition as he really has not got the hang of putting the injection in the right place ! The others walked around the village and enjoyed the typical sights of an African village; people making beds, cooking, etc. Liz was surprised that there was nobody making coffins, as that is, all too often, a common sight. Before they left Liz gave a Manchester United scarf to the security guard who had escorted them every day. He will now be the envy of his brother who has painted his car bright red, with GIGGS on one side (presumably the left wing!) and ROONEY on the other (should be Valencia). They then packed up and flew back to Mwanza. Liz said that it was the same scenario as we had experienced in Botswana, waiting on a dusty airstrip, whilst a plane materialises out of the blue sky (it is is much cooler now, after the rains) and taxis to a stop in front of you. They are now back at the Vizano hotel in Mwanza. Tomorrow the rest of the team are going to Bukumbi, which is supported by Bridge2Aid. For those new to this blog, this is a village a few miles South of Mwanza which is a refuge for people suffering from leprosy and a few families of albinos. Unfortunately, albinos are shunned by society BUT, for some perverse reason, they are often killed by local witch doctors for 'good luck talismans'. Last year the Prime Minister appointed an albino onto his cabinet to champion the cause of the albinos in Tanzania. Below is a photo of an albino woman at Bukumbi with her non-albino baby. Liz spent the morning at the Tilapia Hotel by Lake Victoria, marking the exam papers from yesterday; some interesting answers ! There was a marked lack of correlation between the practical performance in the field and the quality of the written answers. One of the guys who failed the practical got 70% for the theory. The rest of the team went to Bukumbi, whilst Liz and Kiaran had a de-brief with Ian Wilson, the co-founder of the charity. Apparently Bukumbi is vastly improved (thanks to Bridge2Aid) since Liz went there 2 years ago; the accommodation blocks have all been cleaned and painted (see below). When they got back, there was a plenary session, going through the highs and lows of the fortnight. Ian said that they are thinking of replicating the scheme in Kenya. There was a couple there with a baby who are thinking of doing a two year term (the parents, not the baby!) at The Hope Dental Clinic, run by Bridge2Aid. The woman had previously participated in a similar scheme in Nepal where they had to trek for FOUR DAYS to the clinic! They then finished off with a BBQ by the lake, doubtless plagued by sand-flies as they were last year. Some local Masai tribesmen came along, in sandals made from bits of old car tyre, and did some jump-dancing (as featured on the BBC segue between programmes). They fly back from Mwanza to Dar tomorrow and will have to be up early (06.30) to get to the airport, not because the flight is early but because it is offically overbooked and they need to ensure that they get first dibs at seats! 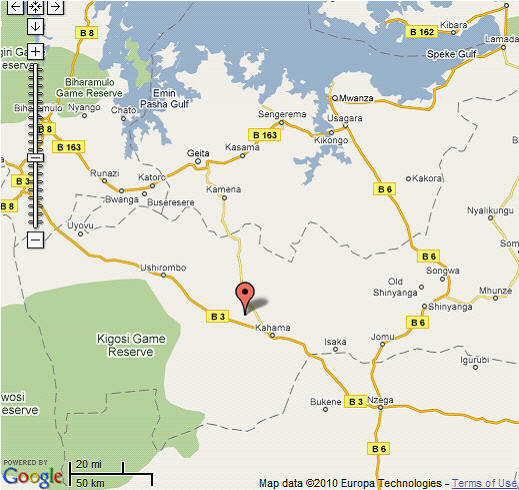 ERRATUM - Where they stayed is NOT the 3rd largest gold mine in the world but (probably) the largest in Tanzania. When they were leaving Mwanza, Liz went up to locate Beryl and knocked on her door. A man came out of the next room stark naked and handed a fistful of notes to a woman who disappeared rapidly. And the hotel looked so nice in the picture ! I got an email (!!!) from Liz to let me know that they had arrived at 10.30 (07.30 GMT). As all of the passengers were there, the plane actually took off an hour early. When they arrived, the temperature in the capital was 360 C ( 970 F ) and they went off to a local craft market where she bought some salad bowls. She drew the line at bringing back a large carved Masai tribesman ! She also managed to knock over a statue of a horse, whose head dropped off .... Ooops! 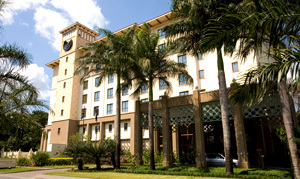 They then went to the Kempinski Hotel (where they stayed in 2008) for a Chinese meal. An early start tomorrow as the plane is scheduled to take off at 09.00. Flight BA 046 took off at 08.54 local time (05.54 GMT) and is due to land at London Heathrow at 15.47 GMT. 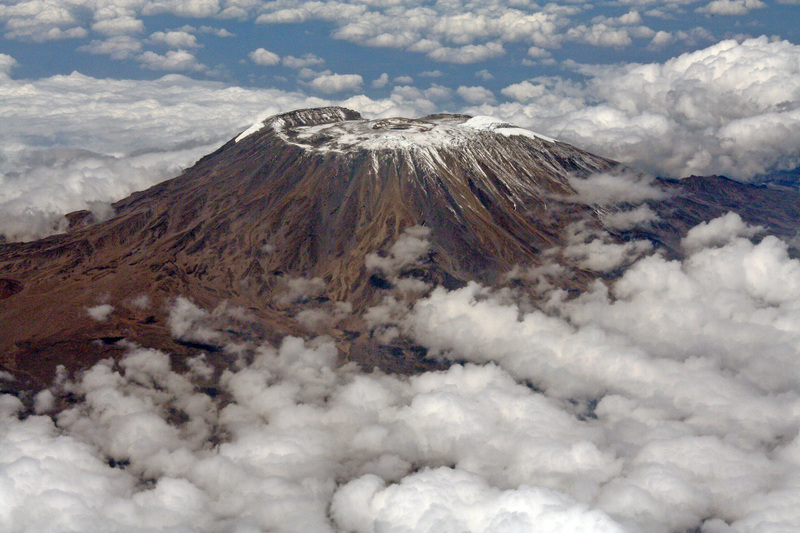 Last year, just after they took off, she managed to take this stunning photo of Mount Kilimanjaro. Hi there, it's me, Liz. I am back at home, now and suffering from culture shock. Many thanks to all of the bloggees for taking the trouble to follow my trip. YES, we are going again next year !